Our 16 flumes are not planned to be used for any long-term experiments during 2019 and will be available throughout the period from April-October 2019. Each individual flume is temperature controlled with both heating and cooling (from sea water). Due to this set-up, the highest temperature differences can be reached in summer. In heating experiments, we will recycle water as it is not technically possible to temperature regulate a flow through system. However, we can exchange water frequently if needed. Last summer was very dry in this part of Norway and the river that potentially could feed the channels was almost dried up. Therefore, if an open flow through experimental design is needed this should be conducted in spring. Project: CRABFISH2. 12 large mesocosms with already established seaweed ecosystem possible for testing two stressors each and in combination. Stressors have now been decided to follow up of mesopredator effects during almost 5 months in the summer of 2019. The project CRABFISH2 for 2019 will be a repetition of CRABFISH which gave interesting ecosystem responses by adding small labrid fish and green crabs, each and in combination. As the mesocosms reflect the ambient conditions, we expect different conditions for the coming year as 2018 conditions were extreme. The project in 2018 showed in addition to promising results, a promising opportunity for well performance of replicated studies of top-down responses on diverse ecosystems in mesocosms. The results from 2018 also indicate mesopredators to affect ecosystem structure and function. The 2018 experiment was visited by Dr Patrik Kraufvelin, he is invited to attend the 2019 project, as well as we invite other researchers to attend and contribute to a successful technical and scientifically run experiment. NIVAs mesocosm facilities at Solbergstrand in 2018 opens for 2 mesocosm experiments in 2018. A total of at least 105 person-days will be allocated to external users through AQUACOSM Transnational Access provision in 2018 to NIVA. For the rocky coastal mesocosms at Solbergstrand, Norway we plan to open for TA to an experiment where partners can participate and experience sampling procedures and result processing on ecological (community) responses on benthic macrophyte communities. Our plan at present is to study effects of two different mesopredators on structure and function on the diverse community dominated by macroalgae and invertebrates. Responses as production, structure, species composition and export of fauna will be measured by different methods developed for years during studies of those communities in mesocoms. During the years, these communities have developed to diverse compositions of intertidal and shallow subtidal macroalgae beds with associated fauna. Also, boxes with sediment and seagrass can be introduced. In addition, some scientists (Germany) will test their own ideas on degradation of plastics in the intertidal wave zone that can be run independently of the other plans. The experiment is not so far funded, but any activity of measurements of community responses will be possible as the mesocosms are running with water supply and all technical devices. The experiment will be initiated in spring 2018 by NIVA, and the best time for users to take part of the sampling will be one week in July and one week at the end of the experiment in late September/beginning of October. Preferably, the closing field campaign in September/October will be the best, both for scientific and the logistic reasons. NIVA has a staff maintaining the mesocoms, in addition we have scientists operating PAM meter and experience with determination of quantitative and qualitative distribution of macroalgae. In addition, Patrik Kraufvelin from Finland has long experience with measurements in those mesocosms and will be a strength for the projects and the users. A minimum of 5-8 persons for 10-15 days is suggested in 2018. Individual users and smaller groups are also invited to apply for AQUACOSM TA in support of larger projects at the facility. We plan two specific experiments in the flumes that will be carried out for most of 2018. The two experiments planned are 1) investigate combined flow and nutrient responses on Bulbous Rush (Juncus bulbosus) growth rate and morph development; 2) effects of warming on ecosystem structure and functioning. Experiments are expected to start in May with 1) followed by 2) starting in August. The latter experiment is planned to continue until at least end of 2018. The experiments are open for AQUACOAM approved TA users, either directly involved in helping to test the hypotheses proposed by NIVA or pursue own research ideas that can be tested within the planned experimental context. Expertise in plant physiology could support our work with 1). In 2) AQUACOAM approved TA users with expertise in functional genetics could be a good contribution. For both experiments ecohydrological expertise and novel ways of measuring flow conditions etc. could be valuable. A total of at least 105 person-days will be allocated to external users through AQUACOSM Transnational Access provision in 2018 to NIVA. A minimum of 1-2 persons per experiment for 20-30 days is suggested in 2018. In 2) we might have more users/groups spaced in time. 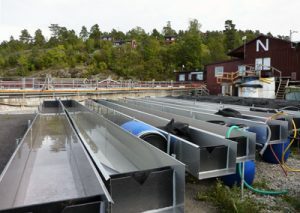 The Solbergstrand Experimental Facility (SEF) of the Norwegian Institute for Water Research (NIVA) in Oslo comprises two complementary mesocosm facilities, a recently upgraded hard-bottom marine mesocosm system and a new freshwater flume system (Fig. 6.18.1). 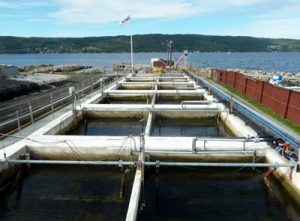 The core of the benthic mesocoms are 12 concrete basins of 13 m3 receiving permanent seawater supply from the Oslofjord. The facility offers unique opportunities to assess community and ecosystem responses to a variety of stressors on European intertidal and shallow subtidal rocky shores. Numerous experiments have been successful completed over the past 20 years, involving a large number of macroalgal and macrofaunal species that have been established in the mesocosms. In addition to manipulating plant and animal diversity of shallow rocky marine habitats, environmental factors such as wave energy, tidal regime, water turbulence, nutrient supply, and acidification by CO2can be experimentally controlled and altered. 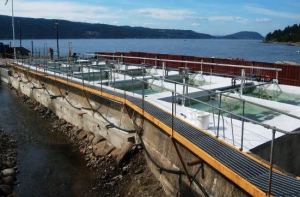 The freshwater facility consists of 16 outdoor stainless steel flumes that are 10 m long, 0.5 m wide and up to 0.5 m deep. 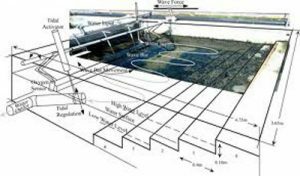 Discharge can be increased to up to 3 l/s per flume to mimic headwater streams. The flumes are typically filled with natural substratum and stocked with biota before starting experiments. However, long- term experiments lasting months or years with natural colonization from a stream running next to the facility are also possible. The flumes can be individually run in circulation or flow-through mode. Stream water distributed to the flumes through header tanks, ground water (insufficient for continuous flow through) or both can be used as water sources to feed the flumes. The master variables that are controlled are discharge, flow velocity and temperature. The latter enables both heating and cooling of the water in each individual flume, a unique feature in running water experimental set-ups at the scale of the flumes. Substratum composition, water chemistry and biological components can be controlled to elucidate responses of stream communities and ecosystem processes to climate change and other environmental stressors. The facility includes pumps, thermostats and a groundwater dwelling in addition to temperature loggers, light meters, velocity meters, etc. Laboratories associated with the facilities on site are equipped for water-chemical, microscopic and other routine analyses. Additional chemical analyses and other measurements can be made at the main NIVA lab in Oslo 60 km north of the SEF. A total of at least 315 person-days will be allocated to external users through AQUACOSM Transnational Access provision in years 2-4. A minimum of 5 persons for 21 days is offered each year. Individual users and smaller groups are also invited to apply for AQUACOSM TA in support of larger projects at the facility. Services currently offered by the infrastructure: External users are given access to the full range of facilities at the Solbergstrand Mesocosm Facility. This includes access to both the marine and freshwater mesocosms and additional laboratory space, instruments, dormitories, kitchen and other facilities as well as wireless network access (see also below). 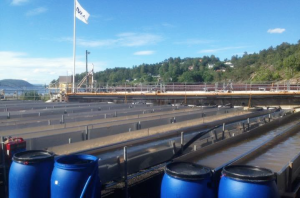 Support offered under AQUACOSM: All external users supported by AQUACOSM Transnational Access can use to the full range of facilities at Solbergstrand Mesocosm Facility. This includes the marine and freshwater mesocosms, laboratory space, indoor aquaria, analytical instruments, kitchen facilities, a meeting room with video-conference equipment, wireless network access and other facilities. Users will receive all training necessary to operate specific instruments and facilities prior to and during the experiments. Nearby dormitories can be offered.